"That's a dated expression and concept," said Judy Fogarty, manager of swanky new men's salon Barbershop Lounge, which recently opened on Newbury Street. "Men taking care of the way they look is much more the norm now." Yes, the number of men who own a moisturizer or two and, heck, maybe even a bronzer is on the rise, which may explain the success of several men's salons that have opened here in the past couple of years. Barbershop Lounge is the latest contender, boasting a pool table, flat-screen TVs, and enough dark wood and exposed brick to make even the most manly man feel at home. "[Men] want a different atmosphere to women's salons and spas," Fogarty said. "They want their own place." Besides hairstyling, Barbershop Lounge offers straightedge razor shaves, facials, pedicures, massages, and manicures. There's even a $5 shoeshine. Memberships are available. Barbershop joins a handful of men's preening parlors around the city, including Emerge Men's Club, High Street Men's Grooming Centre, State Street Barbers, and the Art of Shaving store. 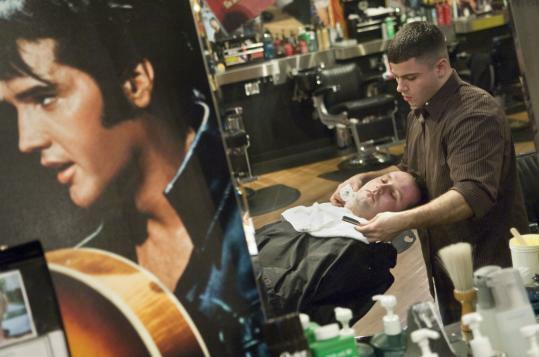 Popular national chain Floyd's 99 Barbershop can be found in Boston and Cambridge. Turns out, men like hanging out in a salon and being pampered just like women do. "I want high quality in a comfortable setting," says Michael Flaherty, owner of High Street Men's Grooming Centre, which opened in November. "I don't want to feel like I'm in the OB/GYN's waiting room." Average haircut: $45, includes scalp massage. Services/amenities: Haircuts, hot shaves, spa services, pool table, and flat-screen TVs. The Platinum Package ($250) includes haircut, shave, hand and foot treatment, 60-minute massage, and shoeshine. Walk-ins? Appointments necessary for shaves and spa treatments. For haircuts, they're recommended, but not required. Average haircut: The Joe on the Go wash and style is $38. Services/amenities: Haircuts, brow wax, manicures. Awaiting master barber license for hot shaves. TV screens in the mirrors of each styling station have AudioSpotlight technology, which means you only hear what you're tuned into, not what the guy in the next seat is watching. Average haircut: $60, includes scalp massage and styling. Services/amenities: Haircuts and complete spa services, including a good old chest wax ($60). Flat-screen TV, Internet access, steam room. Walk-ins? Appointments preferred; necessary for spa services. Services/amenities: Cuts, color, shaves. The salon is unisex, but 75 percent of customers are men. A face and head shave will run you $50. Wi-Fi and Internet stations. Walk-ins? Sure thing. Customers can also check their stylist's schedule online. Average haircut: $34, includes straight-razor neck shave and shoulder massage. Services/amenities: Complete grooming, including cuts, color, shaves, facials, and manicures. Walk-ins? Appointments are recommended, but not required. Average haircut: No cuts. It's all about product. Services/amenities: Impossibly wide range of shaving and grooming products. Another location with barber services is expected soon. Walk-ins? Shoppers welcome. Check online for special events.